Proponents of taxpayer-funded “democracy vouchers” and Initiative 122 declared they would “get big money out of politics” in Seattle. It doesn’t quite look that way as we approach the Aug. 1 primary election. No question, Initiative 122 did create a pool of vouchers for candidates who agreed to certain limits, lowered the maximum contribution to candidates to $500, and barred contractors from writing checks to city candidates. But “get the big money out”? 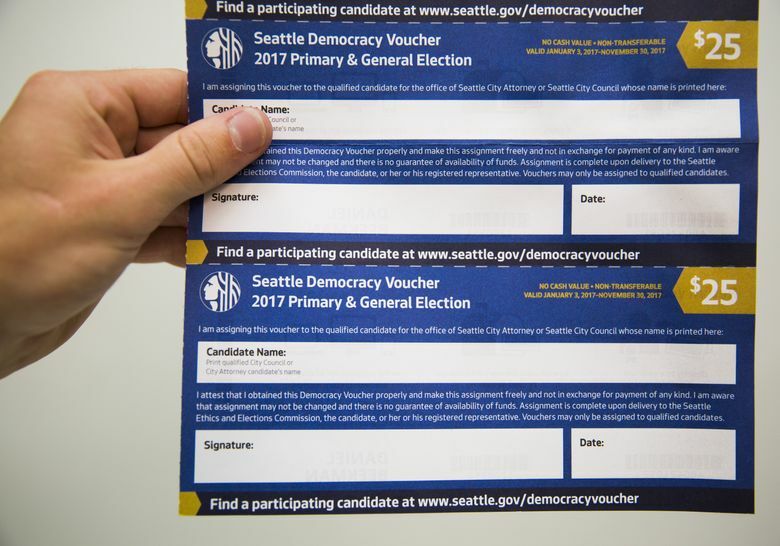 Four Seattle candidates qualified for democracy vouchers as of July 28: City Attorney Pete Holmes and City Council Position 8 candidates Hisam Goueli, Jon Grant and Teresa Mosqueda. Amazon dumped $250,000 into the political action committee (PAC) of the Seattle Metropolitan Chamber of Commerce this month, part of the $667,728 the PAC has amassed in advance of Tuesday’s primary election. Unlike candidates, PACs can collect unlimited amounts. And 50 corporations, business groups and individuals account for the vast majority of the chamber’s political arsenal. The PAC has already started spending on newspaper and social-media ads through so-called independent expenditure (IE) campaigns in City Council and mayoral races. Those IE campaigns can’t coordinate with candidates — and they don’t face spending caps like candidates who take democracy vouchers. Alan Durning, who helped author I-122, said he’s pleased with how it’s working so far on its “shakedown cruise” in City Council races, which for the primary means Positions 8 and 9. It has helped a couple of candidates compete with well-funded rivals, said Durning, executive director of the nonprofit Sightline Institute. As for the chamber’s bulging kitty, Durning said he doesn’t think it has much to do with the four $25 vouchers sent to every registered voter in Seattle. He sees it as part of a national trend in elections flowing from a 2010 U.S. Supreme Court decision barring restrictions on independent political expenditures by corporations, unions and other groups. There isn’t enough evidence to show democracy vouchers are causing this, Mahon said. But there is a correlation developing, he said, that increased IEs are occurring after limits were lowered on contributions to candidates. The chamber PAC already has raised more than it did for the 2013 and 2015 city elections combined. There’s another issue: Just three of 15 City Council candidates have qualified for vouchers at this point — all in Position 8 — and not all are happy about the hurdles they’ve faced. As of Friday, less than 1 percent of the 2.1 million vouchers mailed to voters have been available for use by candidates. To qualify, they had to collect contributions from 400 Seattle residents whose signatures have been verified by elections officials. 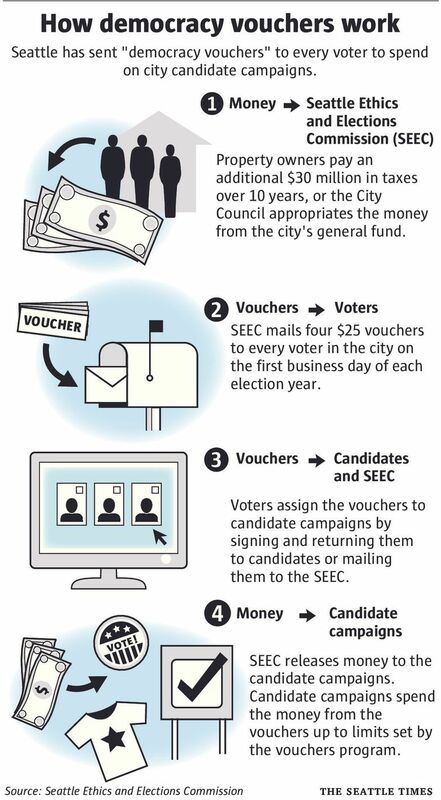 Vouchers aren’t being used in this year’s mayoral election. Proponents wanted to allow time for voucher funds, infused with $3 million a year in property taxes, to stockpile and give them a trial run before applying the experiment to the city’s highest office, Durning said. Vouchers and IEs have been most prominent in the primary for City Council Position 8. Moneywise, three candidates stand out in a deep field (the top two vote-getters on Tuesday, as in all primary races, advance to the Nov. 7 general election). Jon Grant, an affordable-housing activist, set out in the winter to start gathering vouchers. Grant accumulated the maximum amount in voucher-contributions, $150,000, allowed in the primary under the agreed-upon spending cap. Teresa Mosqueda, a labor-movement leader, was the second council candidate to qualify. As of Friday, Mosqueda had $104,825 in vouchers. Sara Nelson, a business owner and former City Council aide, chose not to use vouchers, so she is not tied to a spending cap or lower maximum contributions ($250 as opposed to $500). Nelson has received $130,335 in contributions, with nearly half coming from $500-maximum contributions. An IE campaign supporting her, People for Sara Nelson, has reported $120,696 in contributions and spending obligations. The chief donors are the chamber’s PAC — whose biggest contributors are Amazon, Vulcan and developer Richard Hedreen — and a hotel and restaurant group, Seattle Hospitality for Progress. Under I-122 rules, when the IE backing Nelson and her own campaign contributions exceeded the primary spending cap that Grant and Mosqueda had agreed to, it triggered a sort of fairness doctrine: Those two were then free to collect and spend contributions above the cap. During the 2015 campaign for democracy vouchers, critics including Mahon predicted I-122 would lead to such a “double-dip” with candidates raising the full amount of vouchers, then opting out of spending caps and raising unlimited additional campaign cash. Two labor-funded IEs popped up to support Mosqueda. One has $108,519 in contributions and spending obligations. The other has spent $9,882 for Mosqueda. Grant is backed by an IE called Affordable Seattle that has reported spending $1,627. Its top contribution has come as in-kind labor from the Socialist Alternative organization. Although outnumbered on the IE front, Grant remains one of the best-funded candidates, said his campaign manager John Wyble. “That wouldn’t have happened before vouchers,” Wyble said. When Grant ran for council in 2015, losing to incumbent Tim Burgess, he raised less than $75,000 through the November election. It’s worth questioning, though, Durning said, whether the bar to qualify for vouchers is too high. Goueli, 39, says he would be the first openly gay Muslim elected to office in the U.S. if he won his bid for council Position 8. He was the candidate closest, but still short of qualifying for democracy vouchers on Friday morning when he said he stood two short of the 400 qualifying contributions and signatures. As time to use vouchers in the primary was running out, Goueli was waiting for city officials to verify more signatures with King County Elections, a process that takes about two weeks, according to the Seattle Ethics and Elections Commission. His experience with democracy vouchers has been “tragic and heartbreaking,” he said. Goueli, a doctor, said he could’ve financed his campaign with contributions from medical-profession friends outside Seattle and Washington. But he opted for democracy vouchers instead. Late Friday afternoon Goueli received an email from the city elections commission saying, “You are in!” He would get $14,775 in vouchers he had collected. The news was bittersweet. He would have almost no time to use his vouchers to reach voters, many of whom had already marked their mail-in ballots by that time. He said he thinks qualifying signatures should not have to come from contributors. Rather, the two processes should be separate, with signature gathering not requiring a financial commitment. “If you don’t have a machine backing you it’s very difficult to do,” he said of qualifying. But the voucher rules require signatures from contributors as a safeguard against fraud, which occurred in Portland’s public-financing system when a volunteer forged qualifying signatures for a City Council candidate. The city elections commission is empowered to change elements of the voucher program between election cycles, Durning said. Durning said his biggest fear about democracy vouchers is that IEs would try to push vouchers to favored candidates. “If the American Plastic Manufacturers Association wanted to come in and set up a door-to-door canvass to overturn our plastic-bag fee, legally they could do that, and urge people to give vouchers to candidates they want,” he said. “I regard this year as something of a relief because we haven’t had anyone try to subvert the system,” he said.